I have to confess – I was not an exemplary student. I recently found some of my old grade cards from elementary and high school. A solid B student. Nothing outstanding. The reason? Focus! Even in my high school sewing class, I chaffed at waiting till the teacher approved one step before she let me move on, but she saved me from later frustration by pointing out mistakes that I could still correct. I’ve always admired those weavers who focused on a technique until they learned it, really learned it, and could explain what the threads are doing. They sample carefully, documenting their process, and can then repeat what works and avoid what doesn’t. They are not “jacks of all trades, masters of none”– they stick with a technique until they master it. That is the weaver I want to be when I grow up. 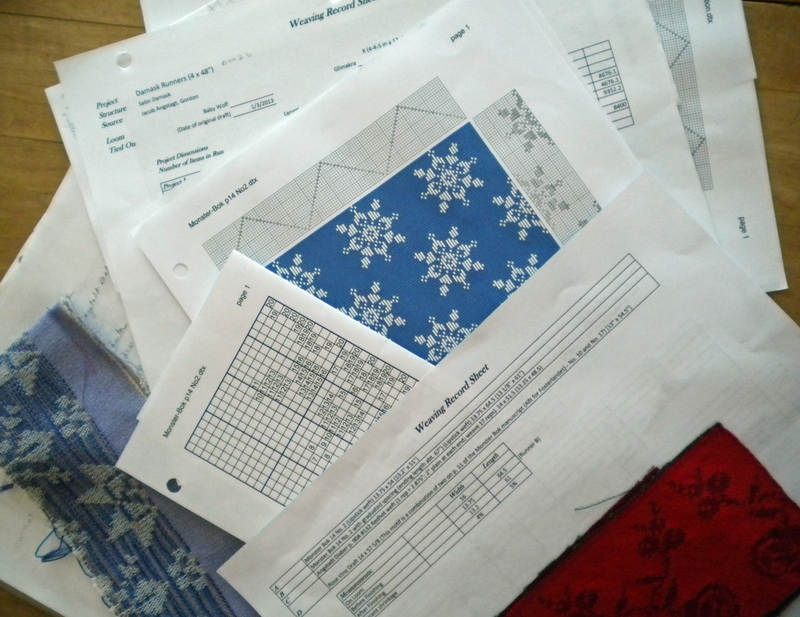 At our recent weavers guild meeting, one of our members shared her samples from an on-line tapestry course she is taking. Every sample showed a different technique, executed with precision. I’m sure she had to take out some as she was learning, but she stayed with it. What a great inspiration! Other members shared what they learned at various summer classes and conferences—Convergence in Milwaukee, a felters symposium, a rep weaving workshop. All these events are opportunities to focus on one technique, one skill, to break open a discipline that can be studied further at home. That’s the real challenge of a workshop or class—to continue learning after the last session and to make the technique my own. That takes focus. For me, it means looking at what equipment I already have, what weave structures I keep coming back to, and getting to know them really well. I have two Glimakra looms; what more can I learn with them? Those looms have drawloom attachments; there’s so much more that those can do than I am currently using them for! So in this late-year review of goals, focus is right at the top of my list. I plan to pay attention to what the threads on the loom are doing, and delve deeper into each weave structure. 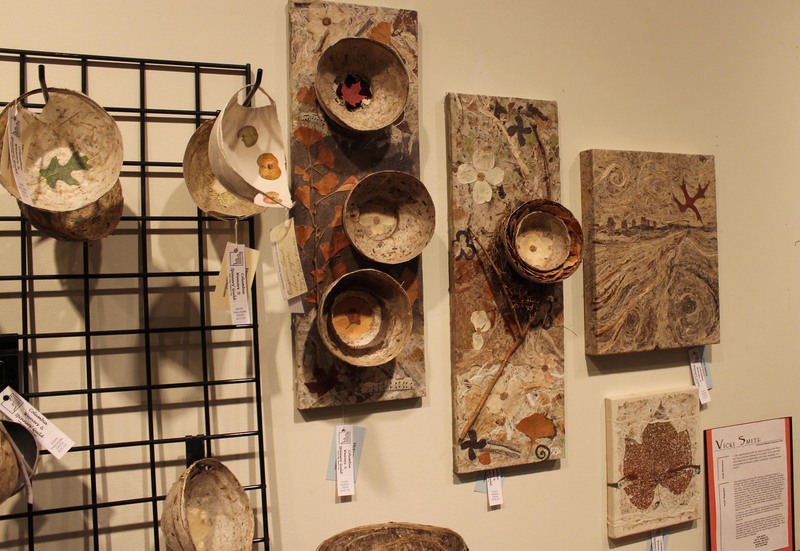 Our local guild’s Holiday Exhibition and Sale has come and gone. What an inspiring weekend! I am always awed by the variety and quality of artwork that all the members share. 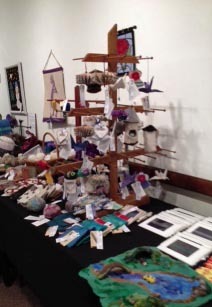 We had a lot more wall art this year, felted pieces as well as hand-made paper. 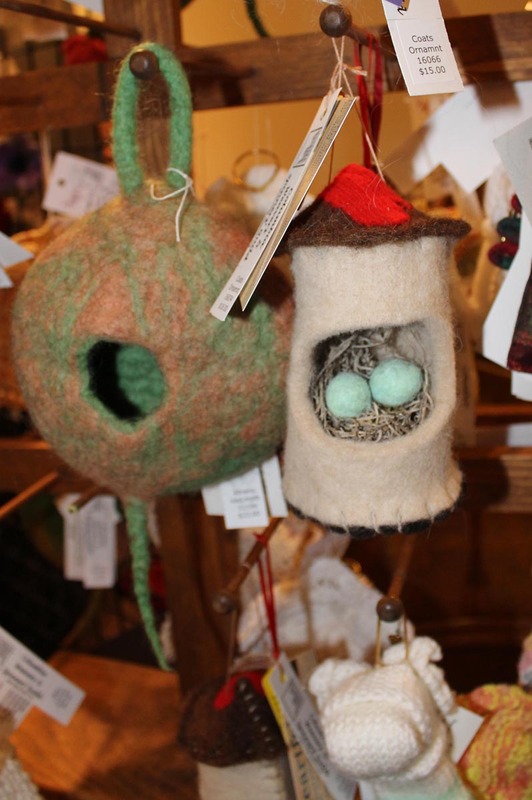 One of our members needle-felted playsets for small hands — adorable landscapes for ducks, hedgehogs, and turtles. Another member repurposed linen clothing into scarves dyed with rust (yes!) and embellished with stitching; so creative! 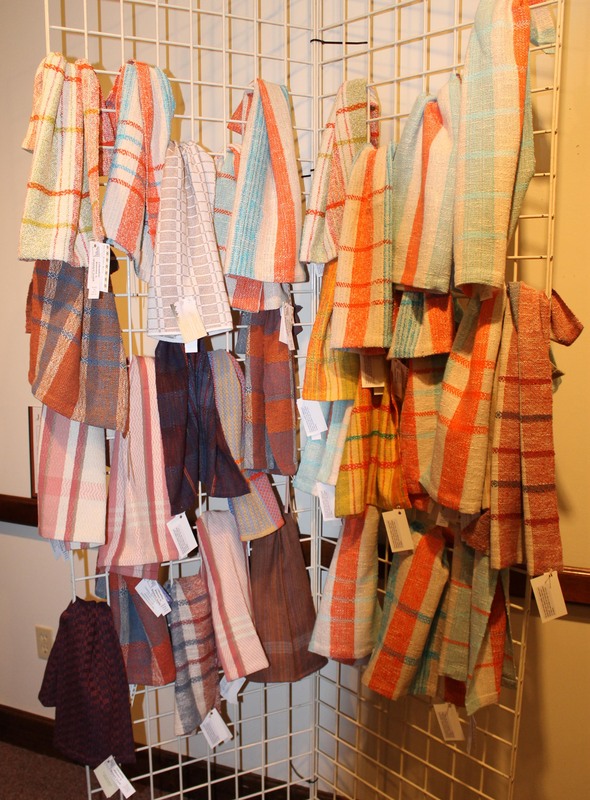 And of course, we had a colorful collections of towels that seemed to fly out the door. I selected an exquisite Scandinavian-style linen towel to come home with me. Yes, we some of our own best customers! I am also humbled, knowing that a guild like this is something to be treasured. Not everyone has this kind of support and inspiration, not to be taken for granted. I wish all weavers were surrounded by an inspiring, encouraging fiber family, if not locally, than at least over the net. May your fiber connections bring you inspiration as the fall quiets into winter. Stay warm! After months of threading, weaving, hemming, meeting, and planning, this is it — our local guild’s annual Holiday Exhibition and Sale is here! We’ve been doing this exhibition for 25 years now. Out of a guild averaging 100 members, 20-25 usually submit items to show and sell. Many other members have demonstrated, greeted, answered questions, and generally hung out at the museum for the weekend. We enjoy each other’s company! And this is one of the ways we reach out to our community to show them what we do and how we do it. Many people have only a vague idea of what weaving, spinning, felting, or paper-making involve. This is our chance to show them. It’s a lot of work, but also a lot of fun. 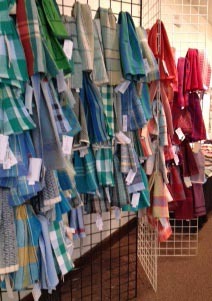 There’s everything from handwovens (of course!) 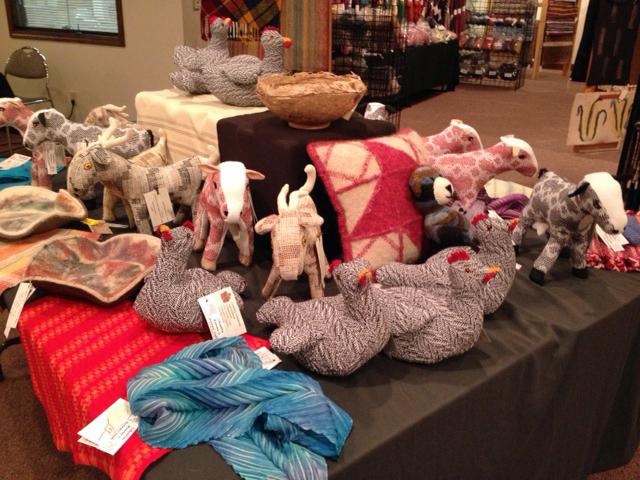 to alpaca fiber, ornaments to jewelry, baskets to handmade paper. If you are in the Columbia, Missouri area this weekend, stop by to see what we have. Details are at http://www.cwsg.missouri.org/holidaysale We’d love to meet you! 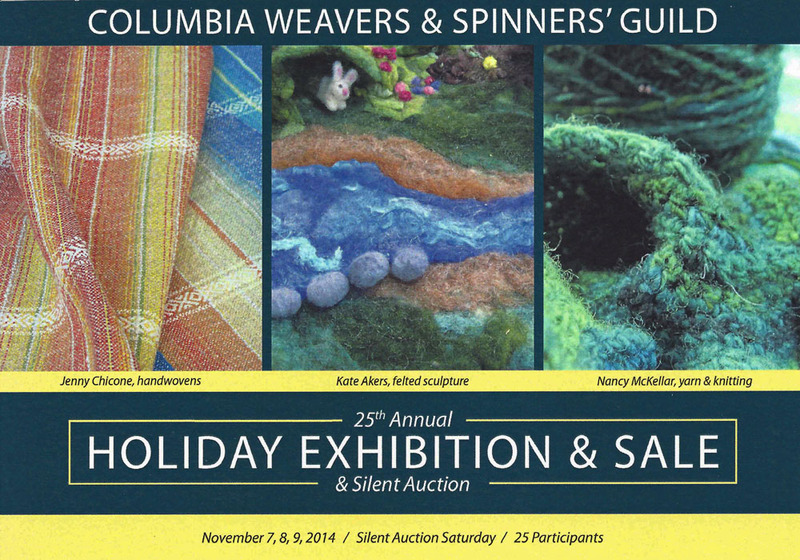 The Columbia Weavers and Spinners Guild is presenting its 25th Annual Holiday Exhibition and Sale this November. When we started in 1990, our goal was to build community, to education the public about fiber, and to learn better marketing skills. 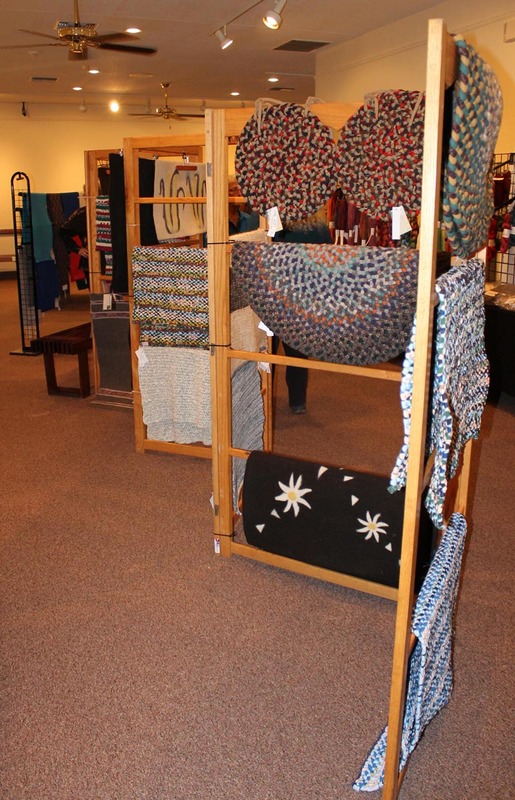 Over the years, we’ve had Girl Scouts, 4-H club members, college students, football fans, people of all ages and interests, come see the demonstrations of weaving, spinning, twining, felting, and knitting. One loom is warped for anyone to try. It’s fun to watch people tentatively throw a shuttle for the first time and figure out how the cloth is formed. And we continue to learn ourselves. How do we present our handwovens? What color is featured in the mass market each year? What is the best way to finish the fiber so the customer can more clearly see what it is? What makes a good display? One of my favorite parts of the Holiday Exhibition and Sale is seeing what everyone else is making. There is so much talent out there, so much creativity, that it fires the imagination! Just look at what can be done! So if you happen to be in Columbia, Missouri November 7, 8 or 9, stop by the Boone County Historical Society Museum and be inspired! I had an interesting conversation with my mother this weekend. She met two women at a community presentation who gave a program on tatting. 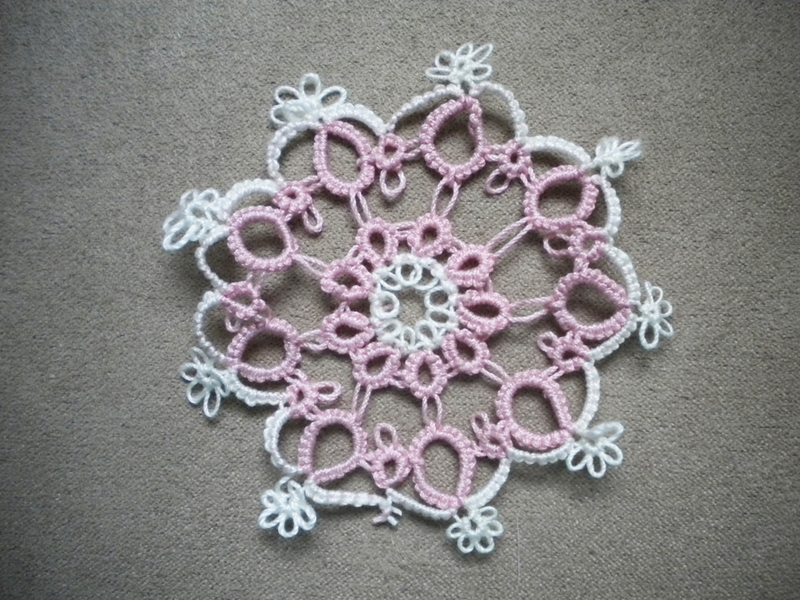 Tatting is a form of lace making. When I was a child, my grandmother told me tatting was a dying art. That was all it took for me to try to learn how to do it. I don’t recall my grandmother tatting—my great aunt was the tatter in the family—but she knew how to point a child in the right direction! I learned the basics of rings and chains after a fashion, then set it aside. One of my first finished pieces of tatting! Fast forward to 2014. I mentioned to someone in my guild that I kept trying to tat, but not really knowing what I was doing, didn’t get much beyond a few rings. She organized a tatting class over two Saturday mornings and now I’m on my way again. Thanks, Ginny! It seems that one skill leads to another and then to another. Some weavers spin in addition to weaving. Spinners often knit and crochet. Weavers and spinners sometimes dye their own fiber. And those with wool sometimes felt it. I surprised a fellow guild member recently by admitting that I spin. It’s a tactile activity that soothes the soul, and I enjoy it. Like I enjoy tatting, knitting, and crocheting. And I’ve even tried my hand at making a booklet. It’s the joy of the process, the joy of working with my hands. Like my grandmother challenged me long ago, I challenge you to try something new. Pick up a craft you haven’t tried before or return to one you’ve set aside. Rediscover the joy of the process and working with your hands!